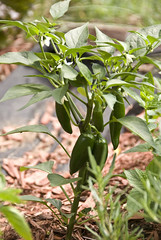 Salmonella signs point to Jalapeno Pepers! Posted on July 6, 2008 | Comments Off on Salmonella signs point to Jalapeno Pepers! That’s just perfect. First the FDA think’s it may be from Tomatoes, and now they think they might just be mistaken and it might be Jalapeno Pepers. “There is a lot of frustration that the FDA cannot tell us where the tomatoes are from or even whether tomatoes are the cause,” said Caroline Smith DeWaal, food safety director at the Center for Science in the Public Interest. Glad I grow my own! My wife cuts them up and adds flavor to our food. Yeah, cuting the budget for the FDA and USDA makes lots of sense now, doesn’t it? Comments Off on Salmonella signs point to Jalapeno Pepers! Finally managed to take some time off from work. Don’t get me wrong, aside from the middle of the night wake up calls (like last night at 1:00am…) I actually like my job and the work that I do. I work on interesting projects, meet interesting people and help to solve a lot of technical problems. I get to play work with a wide variety of technology and literally solve problems in Europe, APAC and various sites in the US. If I don’t have a tool I need, since I’m a programmer, I tend to make any tool I need to handle the problem at hand. But every now and then, I need a break to work on my house and or just to relax. This week, Janny and I will be painting two rooms, work on our yard, and generally cleaning up the house. While I don’t particularly like painting, I’m looking forward to it. I’m hoping that I’ll have time to complete this model too. It’s a Bandai MG RX-78-2 Gundam. You can see what it looks like assembled here at Dalong.net (A very cool Korean site about Gundam Models). I’ll also process and post photos I took to Flickr. I’ve been so busy at work that I’ve not been able to walk around and take much photos. “Mercy” by Duffy from the “Rockferry” Album. You can see the video here. Spring is here so It’s time to prepare my vegetable garden again. With all the tasks at work (4 Projects Due at the same time *AND* late night calls 4 to 6 days a week…) I’m really looking forward to doing work that my wife and I can enjoy. Also, for our garden, we’ve planted new mixed color peonies. That was a little amusing as my wife got the little shovel, put on gloves, dressed in old jeans in case it got dirty and then I did all the work. “Beautiful Seed” by Corrinne May from her “Beautiful Seed” Album. You can see the video of her playing it live here. Must be able to tune it. The old one had a carburetor that could not be adjusted in any way which made tuning it impossible. Must to be able to mulch. Must be able to buy parts for it. So we went shopping and I decided to go with a Toro. My reasoning is that they make fine lawn mowers, have a great reputation and you could order any parts for it. Here is the lazy part: It has front wheel drive. That may not sound lazy until you consider our house is on a 40 by 100 ft parcel and the house and garage take up most of it. General Attitude by Collective Soul from the “Youth” Album.